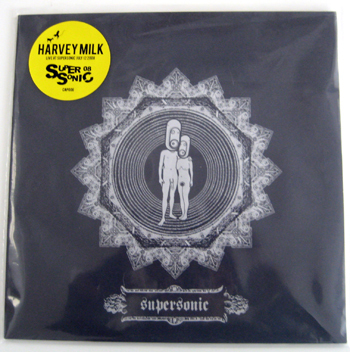 We have just released a limited edition clear vinyl recording of Harvey Milk live at Supersonic 2008, it can be purchased exclusively from our shop – get them while you can! This follows on from our OXBOW DUO performing Loves Holiday feat. Stephen O’Malley, Justin Broadrick , Dave Cochrane + Chipper live release from Supersonic 2007. Recorded at Supersonic 2008, this was Harvey Milk’s first ever UK performance. After much persuasion Capsule managed to coax Harvey Milk out of America to play in the UK for the first time. Saturday night on the outside stage at Supersonic 08 became a memorable occasion with this long awaited performance providing a suitably raucous climax to the festival’s proceedings…they certainly didn’t disappoint then and we’re equally excited to have been able to record and package up this little piece of Supersonic memorabilia as a special souvenir, whether reliving the experience or wishing you’d be there, we’re sure you’ll cherish it.